With so many fence contractors serving the Manhattan Beach area, why should you and other local home and business owners choose J&J Fence? We build beautiful, long-lasting fences, customized to each Manhattan Beach client's unique needs. We offer competitive pricing and new customers enjoy an additional 10% off. We offer expert guidance for the design and planning of every fencing project. We provide free on-site cost-estimates. We are a local, family-owned business that is passionate about the fence industry. We have a reputation for being professional, on time and reliable. When it comes down to it, we pride ourselves on being easy to work with and are 100% committed to realizing your dream fence. We are only satisfied when you are. We closely supervise every project and never subcontract. Fencing is our life and we stand behind our high quality work. Each person on our staff is a master fence craftsman. They have been building and installing iron, wood, vinyl, aluminum and steel fences for an average of 15 years. Since our team specializes in custom work, we are highly skilled at making fencing for residences, business and high security properties. In addition to our standard privacy and semi-privacy fences, we can create gorgeous combination fences. A combination fence usually involves two materials, such as a cinder block walls with iron pickets or a wood stockade fence with iron tips. 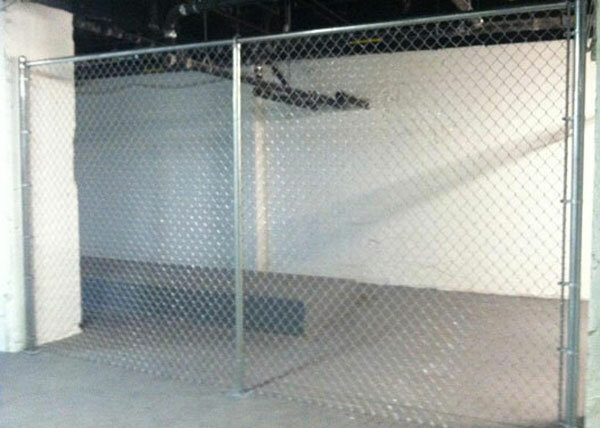 We also sell, install and repair chain link fences, which can be modified with razor wire or barbed wire. No matter what your fencing project is, we can build it. Call us today for a free consultation and estimate. Our gate services are just as high quality and diverse as our fence services. 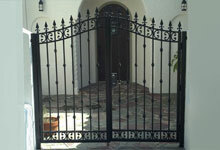 We can make gates out of any material and design them to match or complement any new or existing fence. Some of our most commonly requested fences include: single and bi-parting folding gates; double entry swinging gates; grill or solid aluminum metal roll up doors; and latch gates. From walkways to driveways, we can fit just about any opening or passageway and modify each gate with the latest features, such as access control systems and motorized gate operators. Call today to learn more! 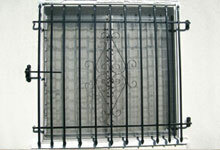 Window bars, grills and grates are available in security iron, wrought iron and ornamental iron to accommodate a wide variety of applications. From ornamental window bars in block wall windows to security grills on first floor rooms, we will give you a regal and long-lasting installation at a fair price. You can work with any of our experts to finalize your design and determine what level of strength your iron needs. 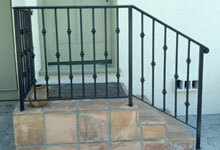 You can also request to have your iron galvanized and powder-coated, as well as painted any color that you wish. More than anything, we are known for our impressive ironwork. In addition to iron fencing, we can create beautiful handrails for staircases, walkways and balconies in Manhattan Beach. These railings can be made out of classic wrought iron or ornamental iron depending upon your budget and how intricate your design is. This is an vinyl fence we installed in Manhattan Beach, CA. The color is called Adobe, and is part of our DuraGrain series, which looks like real wood. 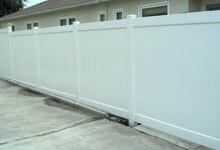 Our vinyl fences and gates also come in a tan or white color, and a wood grain or smooth finish. All of our vinyl products come with a lifetime warranty offered by the manufacturer.